The vertebral column is a series of approximately 33 bones called vertebrae, which are separated by intervertebral discs. 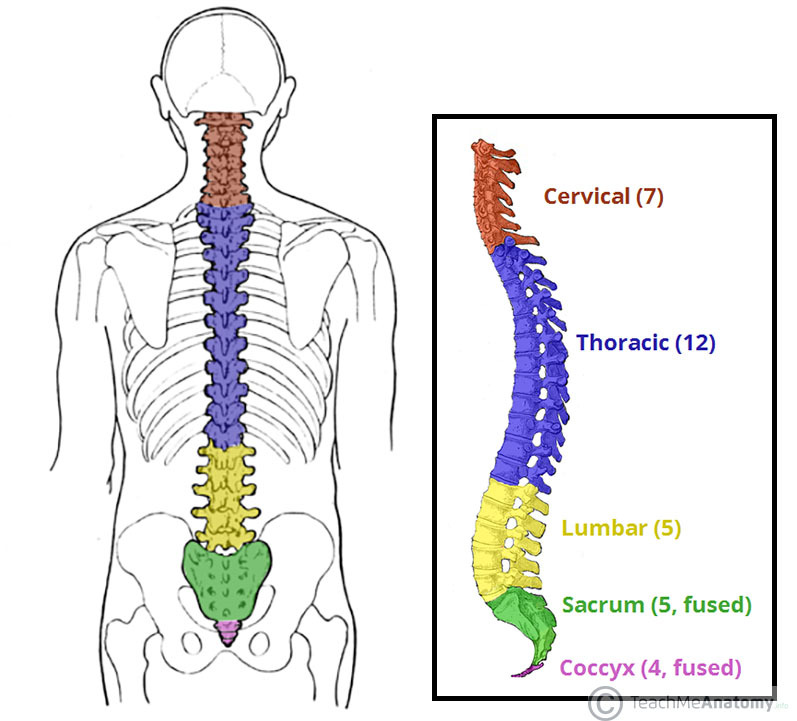 The column can be divided into five different regions, with each region characterised by a different vertebral structure. In this article, we shall look at the anatomy of the vertebral column – its function, structure and clinical significance. Protection – encloses and protects the spinal cord within the spinal canal. Support – carries the weight of the body above the pelvis. Axis – forms the central axis of the body. Movement – has roles in both posture and movement. Fig 1 – The vertebral column viewed from the side. The five different regions are shown and labelled. All vertebrae share a basic common structure. They each consist of an anterior vertebral body, and a posterior vertebral arch. The vertebral body forms the anterior part of each vertebrae. It is the weight-bearing component, and vertebrae in the lower portion of the column have larger bodies than those in the upper portion (to better support the increased weight). The superior and inferior aspects of the vertebral body are lined with hyaline cartilage. Adjacent vertebral bodies are separated by a fibrocartilaginous intervertebral disc. 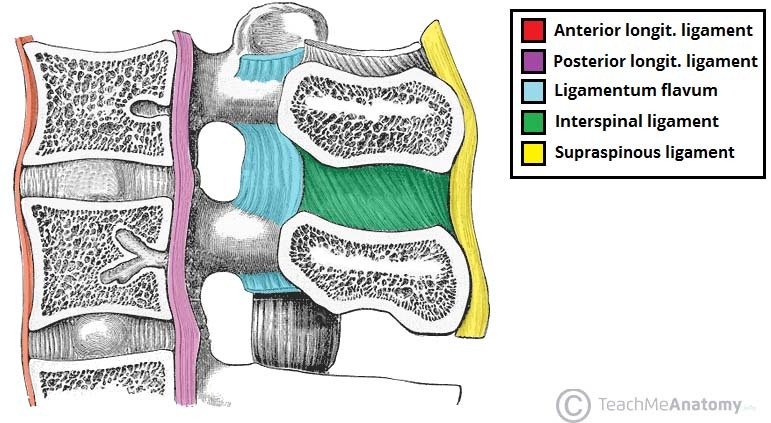 Fig 2 – The general structure of a vertebrae. The vertebral arch forms the lateral and posterior aspect of each vertebrae. In combination with the vertebral body, the vertebral arch forms an enclosed hole – the vertebral foramen. The foramina of the all vertebrae line up to form the vertebral canal, which encloses the spinal cord. 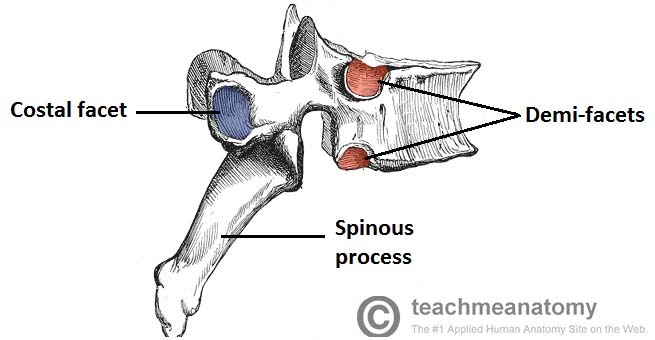 Spinous processes – each vertebra has a single spinous process, centered posteriorly at the point of the arch. Transverse processes – each vertebra has two transverse processes, which extend laterally and posteriorly from the vertebral body. In the thoracic vertebrae, the transverse processes articulate with the ribs. Pedicles – connect the vertebral body to the transverse processes. Lamina – connect the transverse and spinous processes. Articular processes – form joints between one vertebrae and its superior and inferior counterparts. The articular processes are located at the intersection of the laminae and pedicles. Fig 3 – Superior view of a lumbar vertebrae, showing its characteristic features. The intervertebral disc is a fibrocartilaginous cylinder that lies between the vertebrae, joining them together. They permit the flexibility of the spine, and act as shock absorbers. In the lumbar and thoracic regions, they are wedge–shaped; supporting the curvature of the spine. Each vertebral disc has two parts; the nucleus pulposus and annulus fibrosus. The annulus fibrosus is tough and collagenous, and it surrounds the jelly-like nucleus pulposus. Herniation of an intervertebral disc occurs when the nucleus pulposus ruptures, breaking through the annulus fibrosus. The rupture usually occurs in a posterior-lateral direction, after which the nucleus pulposis can irritate nearby spinal nerves – resulting in a variety of neurological and muscular symptoms. Fig 4 – Herniation of an intervertebral disc. 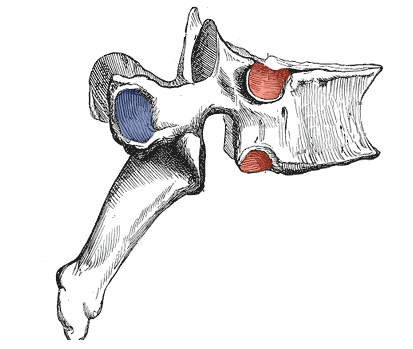 Bifid spinous process – the spinous process bifurcates at its distal end. Exceptions to this are C1 (no spinous process) and C7 (spinous process is longer than that of C2-C6 and may not bifurcate). Transverse foramina – an opening in each transverse process, through which the vertebral arteries travel to the brain. Two cervical vertebrae that are unique. C1 and C2 (called the atlas and axis respectively), are specialised to allow for the movement of the head. The twelve thoracic vertebrae are medium-sized, and increase in size from superior to inferior. Their specialised function is to articulate with ribs, producing the bony thorax. Each thoracic vertebra has two ‘demi facets,’ superiorly and inferiorly placed on either side of its vertebral body. The demi facets articulate with the heads of two different ribs. On the transverse processes of the thoracic vertebrae, there is a costal facet for articulation with the shaft of a single rib. For example, the head of Rib 2 articulates with the inferior demi facet of thoracic vertebra 1 (T1) and the superior demi facet of T2, while the shaft of Rib 2 articulates with the costal facets of T2. The spinous processes of thoracic vertebrae are oriented obliquely inferiorly and posteriorly. In contrast to the cervical vertebrae, the vertebral foramen of thoracic vertebrae is circular. Fig 6 – Lateral view of a thoracic vertebrae. There are five lumbar vertebrae in most humans, which are the largest in the vertebral column. They are structurally specialised to support the weight of the torso. Lumbar vertebrae have very large vertebral bodies, which are kidney-shaped. They lack the characteristic features of other vertebrae, with no transverse foramina, costal facets, or bifid spinous processes. However, like the cervical vertebrae, they have a triangular-shaped vertebral foramen. Their spinous processes are shorter than those of thoracic vertebrae and do not extend inferiorly below the level of the vertebral body. Their size and orientation allows for clinical access to the spinal canal and spinal cord between lumbar vertebrae (which would not be possible between thoracic vertebrae). Examples include epidural anaesthesia administration and lumbar puncture. The sacrum is a collection of five fused vertebrae. It is described as an inverted triangle, with the apex pointing inferiorly. On the lateral walls of the sacrum are facets for articulation with the pelvis at the sacro-iliac joints. The coccyx is a small bone which articulates with the apex of the sacrum. It is recognised by its lack of vertebral arches. Due to the lack of vertebral arches, there is no vertebral canal. Separation of S1 from the sacrum is termed “lumbarisation”, while fusion of L5 to the sacrum is termed “sacralisation”. These conditions are congenital abnormalities. 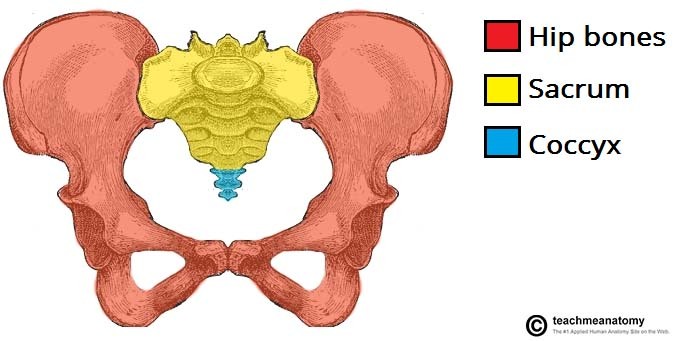 Fig 7 – Diagram of the sacrum and coccyx, articulating with the pelvic bones. Left and right superior articular facets articulate with the vertebra above. Left and right inferior articular facets articulate with the vertebra below. Vertebral bodies indirectly articulate with each other via the intervertebral discs. The vertebral body joints are cartilaginous joints, designed for weight-bearing. The articular surfaces are covered by hyaline cartilage, and are connected by the intervertebral disc. Two ligaments strengthen the vertebral body joints: the anterior and posterior longitudinal ligaments, which run the full length of the vertebral column. The anterior longitudinal ligament is thick and prevents hyperextension of the vertebral column. The posterior longitudinal ligament is weaker, and prevents hyperflexion. Ligamentum flavum – extends between lamina of adjacent vertebrae. Interspinous and supraspinous – join the spinous processes of adjacent vertebrae. The interspinous ligaments attach between processes, and the supraspinous ligaments attach to the tips. Intertransverse ligaments – extends between transverse processes. Fig 9 – Radiograph of scoliosis of the spine. Kyphosis – excessive thoracic curvature, causing a hunchback deformity. Lordosis – excessive lumbar curvature, causing a swayback deformity. 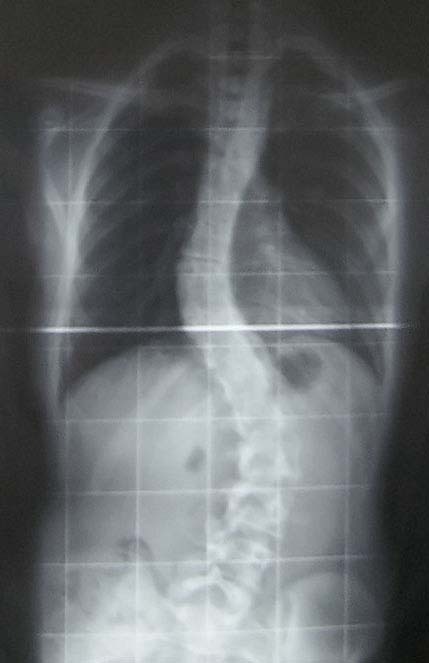 Scoliosis – lateral curvature of the spine, usually of unknown cause. Cervical spondylosis – decrease in the size of the intervertebral foramina, usually due to degeneration of the joints of the spine. The smaller size of the intervertebral foramina puts pressure on the exiting nerves, causing pain. 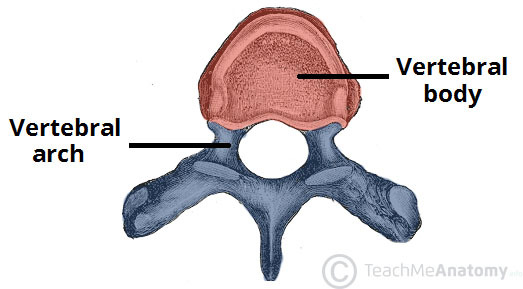 Which type of vertebra is shown in the illustration below? In which direction does the nucleus pulposus most commonly herniate? Which of the following ligaments primarily supports the vertebral body joints?